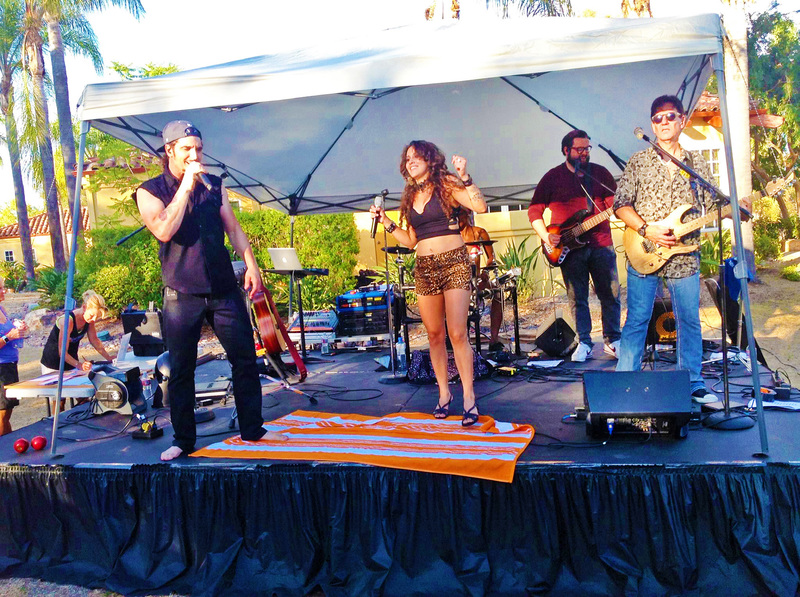 We went to a private fund raiser recently and had the pleasure of seeing the San Diego band appropriately called “ Caliber”. Caliber was named the 2014 winner of “Best Local Band” and I can see why. Besides the fact that they are excellent musicians and singers, they ooze of charisma while performing. Brian Prusinski and Lady Ivy are the front people and both look like they are having a great time on stage. Scott Proseus adds to the sound with his expert guitar playing . Case in point, during one song I could have closed my eyes and sworn Santana himself was on stage. They are known for engaging the audience and didn’t disappoint on this venture. They came off of the stage to dance with us, had us singing, and at one point threw out percussion instruments for us to shake to the up-tempo tunes they were playing. Most of the music we heard was dance music from every era including today’s hits. If we weren’t shaking our booty out on the dance floor we were sitting back and enjoying the high caliber music. Pun intended. A fun, fun, fun, band that I recommend going to see or booking for your event. Here is their contact and their website.